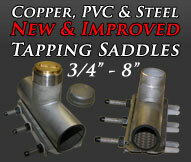 TapCopper.com now manufactures copper pipe saddles, PVC and steel sleeves for hot tapping and line stopping. Sizes range from 3/4"-8" & custom sizes are available. If you need help finding the kit that's right for your project please do not hesitate to call us at 1-800-279-5659. Copper Pipe SaddlesExact Fit for Copper Pipe OD ranging 3/4"-8" (CTS)Copper pipe service saddles are used for tapping water, sewage and air systems with working pressures: 150 PSI. Steel & PVC Saddles 499 Hot Tapping Saddles for: Exact Fit for Steel and PVC (IPS) PVC and Steel service saddles are used for hot tapping water, sewage and air systems. Units are normally 8" wide. They can be cut down to 6" wide to accommodate space limitations and we do offer 12" wide units as seen on the price list in a few select sizes. We can have specialty sizes made for you...Ex: 2" x 3/4" CTS with 5.00" Width -Special order them with Female outlets (FIB) Its our business to work with your business to make sure your copper pipe saddles meet and exceed every spec in the industry and to make your hottap easy. Successful Copper Pipe Tapping: The patented Exact Fit 360 degree complete circle gasket provides a safe and reliable seal while insulating the saddle from galvanic corrosion. PipeFreeze.com: Pipe Freezing Services 3/4" - 36"
© 2018 2LBin Inc. All rights reserved.